This episode, Sam Riordan of MetaArcade joins Jon, Chad and Murph for a discussion about the interactive storytelling game Cthulhu Chronicles, as well as new angles on cosmic horror. And we’re happy to announce that this episode is sponsored by Squamous Studios, and we’ll have some more to say about that in a little bit. Thanks to Squamous Studios for the support! This episode was recorded on January 17, 2019. Thanks very much again to Squamous Studios for signing on as official sponsor for Episode 165. We’re pleased to announce that the company has launched the first expansion of Feed the Shoggoth: Morsels of Madness! Feed the Shoggoth! : Morsels of Madness will include 42 cards, featuring: New Cult Factions, New Artifacts, New Spells, New Minions, Rules Summaries for the players, and more! The ENWorld forum had a poll for favorite gaming podcasts, and the results were announced on the Morrus’ Unofficial Tabletop RPG Talk podcast. They did 10 of each in the categories of Talk and AP podcasts. Go listen to their podcast if you want to hear the whole list. THE CAMPAIGNER magazine #26 has a 8 page special feature about Call of Cthulhu, with a long interview with line editor Mike Mason. The digital edition is just $1, and well worth a read! Chaosium is looking for GMs for the upcoming year. Chaosium announces latest CoC licensee – Dog Might Games, who make wooden Keeper screens and dice boxes. Also, a new free downloadable PDF has been added to the GGP website, it’s called The Adepts of Teris, it’s a group for Cthulhu Invictus. Also, there’s a tip jar on the company website now. Stygian Fox has announced the release of an overarching campaign framework written by by Jeff Moeller that ties together scenarios in The Things We Leave Behind. It was a backer-only reward for the Kickstarter, but now that it’s been fully delivered that mini-campaign frame is now released publicly and you can get it on DTRPG. Cthulhu Reborn has released a free-slash-pay what you want 27-page PDF scenario for Dateline: Lovecraft – written by Noah Lloyd, who is half of the Reckoning of the Dead website. It is described as ”a rather gruesome newspaper-linked scenario called “Smoke Green” set entirely in Arkham. “When millionaire industrialist Reinhart Laine picked Arkham to be the site of his grand new Tobacco Rolling Factory, few could have predicted the rapid good fortune that his new “Reinhart Cigarettes” would achieve. Here’s one from Mike Medwick! “Greetings, esteemed gentlemen– I greatly enjoyed your extended discussion of “Crack’d and Crook’d Manse” — a venerable scenario that can offer a very serviceable introduction to the Lovecraftian milieu for those new to the game. 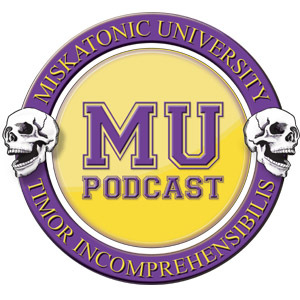 It’s also one that’s well suited to allow new keepers to stretch their riffing and tweaking skills to address some of those awkward scenario elements you dealt with in this episode. I was tickled—absolutely tickled, I tell you—to hear that you have fond recollections of the single session of “Crack’d and Crook’d Manse” I ran for you back in 2015. Dan’s private investigator truly stood out in that session. But If I recall correctly, you all originally decided that the ENTIRE PARTY would be comprised of lawyers—which set me scrambling to invent some kind of skulduggery on the part of the Dodge Brothers that the party could uncover during their investigation of the house. I think Murph is absolutely right to say that somebody needs to die in this scenario to showcase what the monster can actually do, but I never really liked the Joe Viirelli angle. Instead, my plan was to have Reginald Dodge send some hired muscle to the house to deal with the investigators while they were on site. The idea was to engineer a gonzo, three-way confrontation between the party, the monster and the bad guys in which several NPCs could get killed in some spectacularly gruesome ways. Eh, maybe it would have worked, maybe not. In any case, I bitterly regret not finishing that scenario with you guys. As always, the MUP crew really shines when they turn their attention to workshopping scenarios in this way—and what a treat to hear all four of you together again for this episode. Keep up the great work, and greetings from the Great Plains of Nebraska—kinda like living on the Plateau of Leng, only more desolate and wind-blown. GO PODS! MetaArcade has put out a call for creators for the MetaArcade platform – the launch of a closed beta for new universes. Blurb from Chaosium: “Cthulhu Chronicles is an interactive fiction game set with light RPG elements, adapted from Chaosium’s Call of Cthulhu tabletop RPG. The game comprises several stories, which tie together into a single plotline. You have 6 characters to choose from when playing, and each has different attributes and backstories that affect how the game unfolds. The story is set in 1920s Massachusetts within the Cthulhu Mythos created by H.P. Lovecraft. Players grapple with safety and sanity in a world of ever-encroaching horrors.